The Missoni style is one that combines natural sophistication, family values and certain originality achieved only by those that walk the walk. For a family that lives life in color, it just makes sense that they would experience tastes and scents in the same vibrant way. So many times, during Milan Fashion Week, I was invited to Missoni’s creative director Angela Missoni's house for dinner and always enjoyed a brilliant, spontaneous and happy atmosphere, one that the Missoni family has mastered for generations - all present. Luckily for us, Francesco Maccapani Missoni, Angela's son, collects the family's recipes and they are now available in the new book Missoni Family Cookbook available at Assouline. Try the recipe for Pesce Bollito con Maionese available here, perfect for a late lunch by the sea combined with white wine and many laughs. Get the whole vibe going with a Missoni capsule wardrobe that is at the same time chic and timeless. Make the maionese: In a large bowl, whisk the egg yolks. Gradually whisk in the extra-virgin olive oil in a fine, steady stream until the mixture thickens. The yolks will be completely emulsified once the mixture binds and lifts from the sides of the bowl. At that moment, slowly whisk in the lemon juice and sea salt. Make the fish: Place a fish poacher across two burners of the stove, or on the middle oval burner if you have one, over medium heat. In the bottom part of the fish poacher, combine the onions, carrots, celery, peppercorns, bay leaves, and cloves and cover with enough water to level with them. Bring to a boil; when the water reaches a rolling boil, remove from the heat and set aside to cool. Transfer the fish to a clean work surface. Peel and discard the skin and carefully fillet the fish. Season with sea salt and serve warm with the maionese on the side. Notes: You can find fresh sea bass larger than 1 lb at your local farmers market or from a fishmonger; doing so is recommend for freshness and taste. Angela never uses extra-virgin olive oil to prepare the maionese and prefers to use a milder, refined olive oil, or peanut or corn oil. 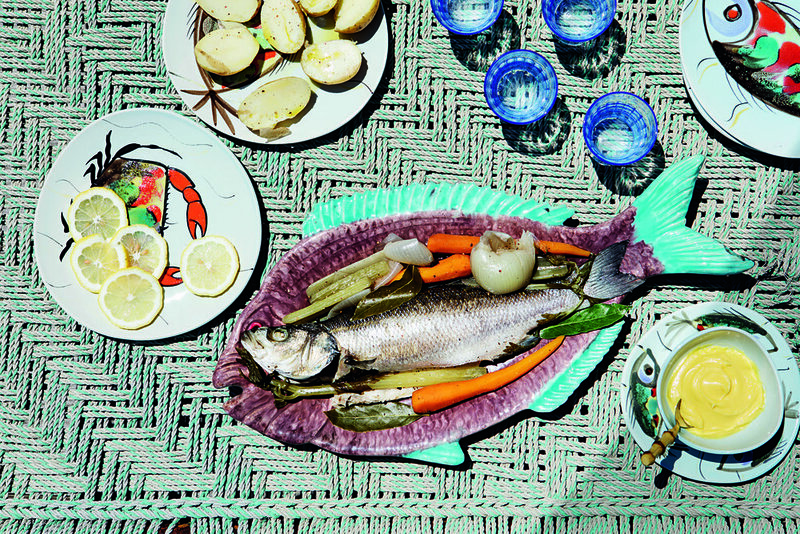 For more amazing Italian recipes buy the new Missoni Family Cookbook by Assouline here.